In London there is a district called Holland Park, fashionable, affluent and dotted with grand Victorian townhouses and high-class shopping. It’s upscale London, just as you might imagine it. Back in 1870, the Lidgate family started a butcher shop that remains a family business and is a centerpiece of the Holland Park community. One thing about British food, no matter what you have heard, no one has ever complained about the meat. It seems to be almost genetic: British meat and game and poultry dishes are outstanding. Lidgate’s is one reason why. 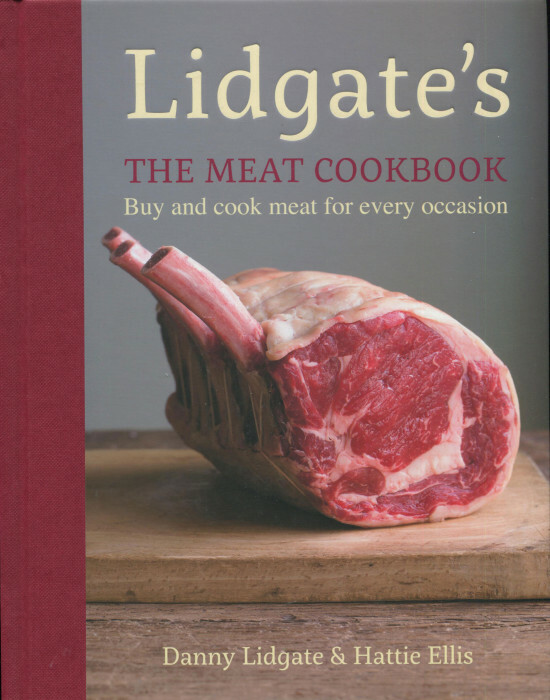 Lidgate’s: The Meat Cookbook displays the detailed knowledge that comes with decades, if not centuries, of tradition plus the lessons learned from a family of superior butchers. There have been several meat cookbooks of distinction in the past few years. This book certainly ranks with the best. There are recipes, diverse and flavor packed, plus excellent descriptions of meats, cuts, and techniques that only experienced meat fanatics could supply. When you have this book in hand, you are going to being thinking very seriously about a shopping trip to Holland Park. And there are supporting chapters, too, for Grills & Barbecues; Special Occasions; and Stuffing, Sauces, Stock & Sides. You’ll find all these recipes, both the British and beyond, to attractive and richly flavored. The writing here is British but easily accommodated in an American kitchen. The ingredient lists are short, ten or less typically, and the recipes themselves are detailed. A recipe is often several long paragraphs giving you precise, step-by-step direction. There’s a little tone here of being in cooking school which is great, because — when you have been seduced by the accompanying picture of the dish — you really don’t want to fail. The handholding here is intense. You won’t fail and you won’t be overcome either. What are Suzen and I going to cook first from this book? Ah, so easy. Well, I would go for the Roast Beef with Yorkshire Pudding. Suzen will hear none of that. 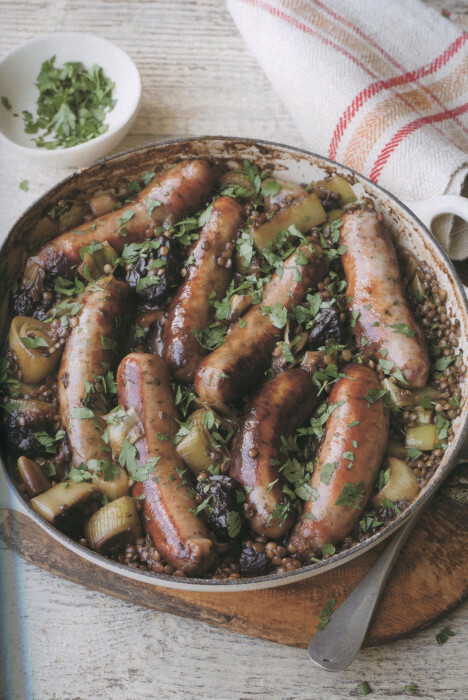 We’re going to begin with the Pork Sausages with Prunes, Guinness & Lentils. My wife likes pork, fruit, beer, and beans. Here’s the picture from the book. I think I can wait for my roast beef after all.